You want to spend more time with your child, but you’re stumped. There must be something you can do with your child that isn’t digital-related – right? Cooking is a great skill to have (for boys and girls), and it allows you to spend time with your child. A lot of my best memories are cooking with my mom. 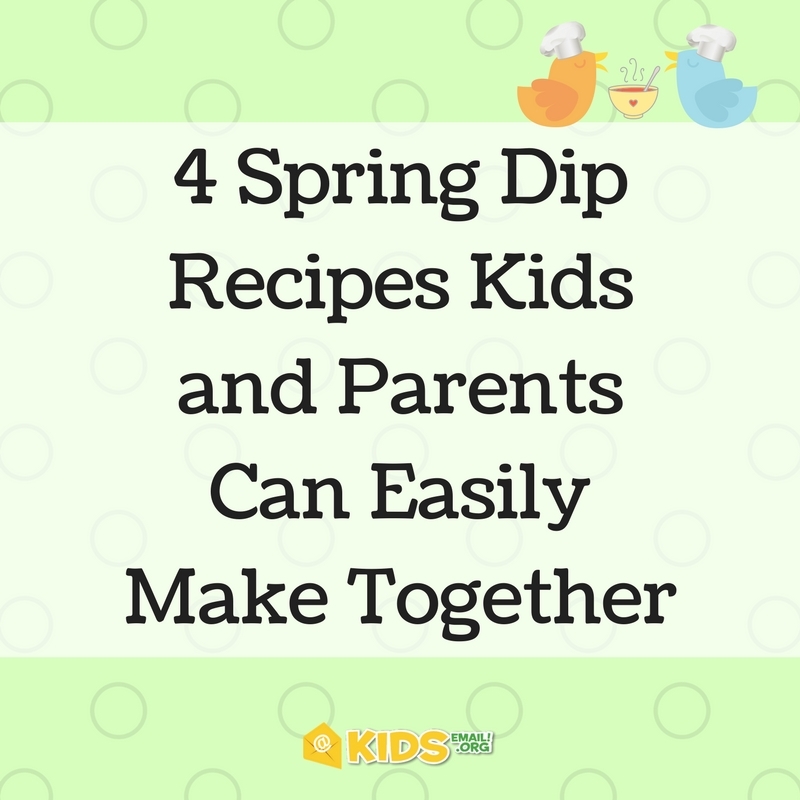 If you want to help your kids stay healthy this school year, teach them to cook delicious spring dips that aren’t filled with bad-for-you ingredients. Don’t worry, we’ll also cover a few dips that will hit a kid’s sweet spot, too. After all, you’re only young once. One of my favorite recipes for kids, strawberry fluff is delicious, a little on the bad side, but really good to eat with fruit. While this may be filled with sugar, if it gets your kids eating fruit, it’s always a major bonus. Since these ingredients don’t require cutting, the kids can make this dip on their own. Simply combine all ingredients into a mixing bowl and mix until smooth. Make sure to whip the whipping cream prior to placing it in the bowl for best results. Mom or dad will be in charge of grating the cucumber. This will then be placed in a bowl that contains the yogurt and lemon juice. Mix well, and you have a delicious cucumber dip that is super kid-friendly to make. Anything can be added to taste. Well, as it turns out, we’ll be discussing two bad-for-you dips, but this is a tasty treat that the whole family will love. Your waistline may not love this dip too much though. You may even want to do a few exercises with your kids afterwards since this dip is so sinful. You can also choose another candy bar if you like. Place the cream cheese and fluff on the counter to allow them to warm to room temperature. Cool whip can be added to taste, but I prefer 4 – 6 ounces normally. Place the Butterfingers into a food processor and blend well. Any method to crush the candy bars into small pieces will work. Now, your kids can take over and choose to beat the cream cheese and fluff in a bowl. Fold in your cool whip and sprinkle your candy pieces on top. You can eat it with a sweet cracker, or you can eat it with a few pieces of fruit, such as an apple. You’ll also add salt and pepper to taste. Mom or dad will want to pour milk into a saucepan, put on medium heat and allow to heat to 180F. Remove from heat and allow to cool in a large canning jar. Kids can start to stir in the yogurt and put on the lid. Place the jar into the sous vide, or take over this job is your child is younger. Add water as needed to ensure the jar stays covered. This will cook for 24-hours, so you must keep adding water to cover the jar. Transfer the mixture to an ice bath and allow to cool while putting the yogurt in a food processor. Add in the remaining ingredients and allow to process. Season to taste and eat away. What do you do to cut back on screen time and spend more time reading, playing sports or spending time with friends?